The train collision warning system has been installed on highspeed trains for the first time ever, showing it’s huge potential for any kind of train installation. 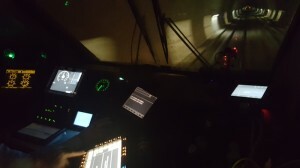 During a recent measurement campaign performed by the German Aerospace Center (DLR) together with Trenitalia in Italy, the collision warning system was used to monitor certain maneauvres while driving with two Frecciarossa highspeed trains through the night with a speed of up to 300 km/h each. Unusual for and very much appreciated by the train drivers, they could see the location and other information about the other train way before in visibility range. In fact, the award-winning direct train-to-train communication subsystem of the collision warning system achieved a new range record, that is 39.5 km while driving – directly, no base-stations or any kind of repeaters involved! One of the most interesting maneauvres performed was a crossing of the highspeed trains on parallel tracks with over 250 km/h each, which is a relative speed of more than 500 km/h. It has been verified that the collision warning system’s radio link worked stable also at this high speed and the trains could see each other using this link way before one of the other direct train-to-train radio links under test. Although the collision warning system was designed primarily for lower speed profiles, it worked out very well for highspeed, too. Thus, mission accomplished! You can dowload the German version or English version of an article about the measurement campaign. Alternatively you can interactively browse through the German version or English version.